Happy Friday! Things are going well here in baby world. It is a ton of work, but so far we're doing just fine. I'm starting to get back in the swing of things and look forward to getting back into blogging and reading everyone else's blogs again! Although, staring at the baby all day does have its charms. The New York Post informs us of more staffing changes at Every Day with Rachael Ray. The Prairie Family Chronicles features a recipe for Sausage Scrambles and Cheese. Hear more about Laura Treonze, the woman who won a kitchen makeover from Rachael Ray's talk show. 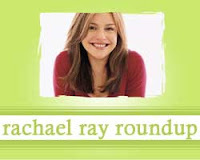 Mike at TV Food Fan informs us that Rachael Ray will be interviewing Barack Obama and his wife Michelle on the campaign trail. Two Scientists Experimenting in the Kitchen! features a recipe for Kale and Portobello Mushrooms. Karen at Busy Mamas tried Chicken Taco Patties, with some help from one of her kids.